There is always things to see and do while in Kota Kinabalu. Located just along the northwest coast of Borneo facing the South China Sea, the city or locally known as KK has plenty to offer ranging from nature, culture, food, to urban nightlife. Pedestrian-friendly walkways make KK the best for exploring on foot. The Filipino market is just within walking distance where visitors and tourists can get the best bargain for pearl and handicrafts. The city is surrounded by beautiful islands gazetted as Tunku Abdul Rahman Marine Park (TARP) and a perfect escapade from the hustle and bustle. January and March, visitors may witness whale sharks and dolphins as they make a stop and pass through the islands during their migration period. Some of Sabah's major attraction are just a few hours drive away from the city centre. The world's highest and Asia's first via ferrata located on Mount Kinabalu is only two hours by road. It is the highest mountain in Southeast Asia. Other accesible places of interest include the Monsopiad Cultural Village, Rafflesia Forest Reserve, Crocker Range National Park, and several beach resorts in Kinarut, in the south of Kota Kinabalu. Immerse yourself in the culture and tradition of the Rungus community as you visit Kudat, the northern most tip of Sabah. From culture to nature, Kudat offers a learning adventure as locals share their cultural expertise with visitors. Kudat is a famous destination for scuba diving, and it is said that the best of Sabah's seafood comes from Kudat. Here, each village is reputable for its individual trade; honey from Gombizau, gongs from Sumangkap, beads from Tinanggol, and the longhouse living culture of Bavanggazo. The Tanjung Simpang Mengayau is a must visit for its spectacular view and it is the meeting point of Sulu and South China Sea. Kudat also offers white-sandy beaches and a perfect spot for surfing. Labuan Island is located off the west coast of Sabah. It is a famous destination for wreck diving and international deep sea fishing. Once a year, there is the Labuan International Sea Challenge, an exciting water sports challenge of deep sea fishing, kayaking and swimming. Explore Borneo's virgin rainforest in search of the world's endangered wild animal such as Borneo pygmy elephants, leopard cat, and white crowned hornbill. A haven for naturalists, Lahad Datu is a gateway to Danum Valley Conservation Area, Tabin Wildlife Reserve, and Madai Caves. The main industry in Lahad Datu is cocoa and oil palm. Apart from that, it is also an important timber exporting port. The town has an airport for domestic flights and MASwings is the only airline that flies to Lahad Datu on daily basis. Sandakan is the second-largest town in Sabah after Kota Kinabalu. 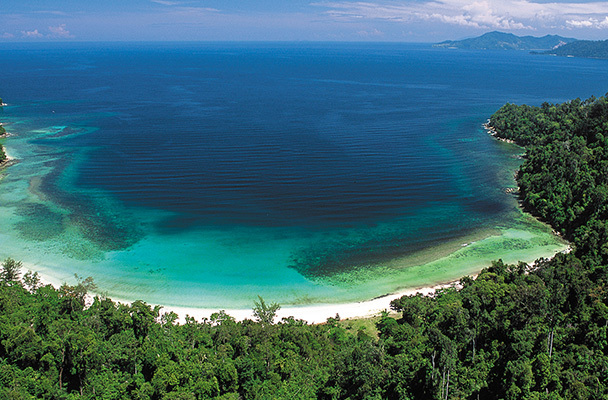 The district sits on the eastern seaboard of Sabah and a gateway for ecotourism destinations. The nature city is steeped in history and until today, there are few surviving buildings after the World War II. If you are new in town, the Agnes Keith House and Sandakan War Memorial are a perfect starting point to get a grasp of Sandakan's intriguing past. A trip to Sandakan is not complete without a close contact with the orang utan at the Sepilok Orang Utan Sanctuary. The sanctuary is considered the oldest and the largest of its kind, and it is a must-visit place. Sandakan also offers one of the best destinations for turtle watching. The Turtle Island Marine Park, which lie in the Sulu Sea, is about an-hour boatride and is noted for its diving attraction. The district is also known for its seafood delicacies. So while in Sandakan, eat like the locals and head to Pasar Sim Sim to have a taste of the famous ikan bakar (BBQ fish). The colourful, vibrant and rich culture of the Bajau community makes Tawau an interesting place to visit. The town is the main entrance to Sabah east coast unique culture and adventure. Tawau is where nature is at her best. It is home to the tallest tropical tree in the world at 88.34m. Visit Maliau Basin and Tawau Hills Park to get close to mother nature. The Madai Caves are important caves in Sabah for harvesting birds' nests. Twice a year, the Idahan people risk their lives to pry precious nests from the cave roof high above. Just an hour drive away is Semporna, a gateway to diving paradise. If you are in the east coast and looking for the best site for muck diving, Semporna is the place to be where some of the well known islands such as Mabul and Sipadan are just a 40-minute boatride away. This part of Sabah is arguably one of the richest destinations for exotic micro and macro marine life anywhere in the world.